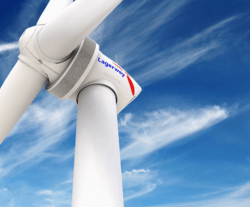 Following ENERCON's takeover of the Dutch wind turbine manufacturer Lagerwey, the brand will be fully integrated into the German company by the end of the year. Lagerwey thus disappears as a product name. In the course of the further merger of ENERCON and Lagerwey, there will be a change in the product types in future: All joint new developments will be marketed uniformly as ENERCON plant types with an "E" series designation. The other key data as well as the geometries of the new system types will remain largely unchanged. The name Lagerwey will thus be removed from the market as a brand by the end of the year. This development will start with the new E-147 and the new E-160, which will also receive an increase in performance. They have still been developed on the basis of the Lagerwey LP4 platform, as Lagerwey Technical Director Aart van de Pol explains in an interview with ENERCON Windblatt (01-2019): "The fast development, which also involved positioning the WECs at a higher level in terms of nominal power than with the LP4, was only possible because we could pool our R&D resources. Other joint R&D projects include the adaptation of the MST tower concept for the EP3 platform and the development of a more powerful Climbing Crane for WECs bigger than the LP2." In addition to bundling technological development, the merger also has advantages for the standing on the international wind energy market. ENERCON Sales Manager Stefan Lütkemeyer explains: "Joining forces benefits us greatly in global competition. Our accumulated development power puts us in an even better position to supply our customers with the most suitable and most competitive WEC technology for their projects all over the world. We offer them a product portfolio that is optimally enhanced." Ronald Boerkamp, Sales Manager at Lagerwey, adds: "What is more, we now have a competitive edge. It would have been near impossible for Lagerwey to do things like take on major international projects completely on its own. But together with ENERCON it is an entirely different story. As a joint venture we have a much wider range of resources available and a much better standing with international project planners and financiers." So far, the cooperation has been excellent - no wonder, as Lütkemeyer emphasises: "East Frisians and Dutch people get along well, that’s not a problem – we’re developing wind energy converters, not playing football!" 2018 Record-Breaking Wind Year in the U.S.
U.S. wind power supports a record 114,000 American jobs, over 500 domestic factories, and more than $1 billion a year in revenue for states and communities that host wind farms.